Sonlight. The original "real books" curriculum. Customers tell us the day FedEx delivers their Sonlight order feels like Christmas. Love learning (maybe for the first time). "Love to Learn/Love to Teach® or your money back." Sonlight books are carefully and lovingly selected. Together, they create a stunning library of award-winning, classic, delightful books that will satisfy your soul and leave your children begging for more. Literally. "Keep reading! Keep reading!" is a request every Sonlight family experiences. Do your children beg to do more schoolwork? My oldest is addictively reading a chapter book, telling herself over and over, "Just one more chapter and I'll stop." Two nights ago she was found reading under the blankets with a flashlight. What a joy to be there to watch your child fall in love with reading! We couldn't agree more. What a joy to be there. And why are books so useful for learning? Because stories stick with us, in a way that fact lists … don't. Another brilliant thing about learning with "real" books the Sonlight way: they allow students to see more than one side. When students read about the first Europeans in North America, Sonlight includes books written from the perspective of the Spaniards, the Africans, the English, and the Powhatan. Each of these groups had a different perspective! What do we learn by listening to multiple sides of a story? Since relationships are vital for a satisfying life: isn't that what you want for your children? Do you have the courage and the humility to teach your children to listen to "the other side"? But the books alone aren't what make Sonlight … Sonlight. A box full of four dozen wonderful books isn't a Sonlight program, any more than a pizza crust, tomato sauce, and shredded cheese is something ready to serve at your family dinner table. You have to combine the parts to make a delectable meal. The award-winning books are merely Sonlight's "farm-fresh, organic" ingredients. The Sonlight Instructor's Guides provide the scrumptious, "chef's secret" recipes. They ensure your children not only enjoy their education, but gain maximum benefit. And best of all, the recipes are easy to follow. They coordinate all the books and tell you, day by day, what to read and when. So that the unique flavors and benefits of the variegated books—the intellectual meal's ingredients—combine into a mouthwatering feast. Every IG—from History / Bible / Literature to Science to Language Arts—schedules the books, provides helpful notes, tells you what activities you will want to do … when (writing exercises, science experiments, field trips, and more). The Language Arts Instructor's Guide tells you what assignments you need to do so your children become capable writers, everything from handwriting and basic decoding (i.e., early reading) in the youngest grades, up through research papers and literary analysis at the high school level. Maybe you make meals that give you delight. They taste delicious, and your family repeatedly thank you for your service in their behalf. That is such a good feeling, to be physically sated, enjoying family time–and to know that you are the hero of the dinner table! That's how it feels to homeschool with Sonlight. You take excellent ingredients and combine them in beautiful ways, as the Instructor's Guide directs, so that your children are happy and satisfied. And you're the hero who serves them the stunning meal. "Hey, guys. It's spring break. Would you like to take a week off from homeschooling like the traditional schools? Get a little break?" My six-year-old: "No, mommy! Please! I love Sonlight! I don't want a week off!" That's the story L.F. told us. And it's a story we hear time and again plays out in thousands of homes just like yours. The children are so excited about what they're learning, they don't want to take time off. And why would they? If you're offered a grass-fed filet mignon, why would you refuse it for frozen fish sticks? Sonlight children know that there isn't anything better they can be doing with their time. Sonlight includes everything you need to teach all subjects. In addition to the books and the Instructor's Guides—for History, Science, and Language Arts, you'll also get any one of half a dozen industry-leading Math programs. —We're happy to help you choose the one that will work best with your children! You'll also get the other, smaller things that make learning come alive. Like a timeline book to help you see the scope and flow of human history. And preprinted stickers of key people and events, ready to place where they belong within the timeline. And how about a high quality map of the world and the United States—so you can learn geography naturally: tracking, while you read, where the stories and history take place around the world. Oh! And the science supply kits! All the "little things" that are likely to trip you up when you want, actually, to do the science experiments: the marbles, powerful magnets, wire, thumbtacks, straws, mirrors, seeds, and more that would drive you nuts if you had to locate them. Depending on the grade, you might also get handwriting or spelling workbooks, or supplemental math materials. Whatever you need to teach your children successfully each year … you'll get it delivered to your home. Try a Sonlight History / Bible / Literature or All-Subjects Package for six months to see if it works for you. If it does, you'll be delighted—and I think that's exactly what's about to happen. If for some reason you're not delighted, then just let us know—and you get all your money back. This offer is unique in the industry. No one else makes such a promise. But we make it because we are confident that you will be thrilled with the excitement and laughter that fills your home. And we know that fewer than 3% of our customers take us up on this offer. Which means that the odds are pretty good that you, too, will enjoy a year of homeschooling like no other: one where your children truly loved to learn … and you truly loved to teach. We want you to experience the wonder of a Sonlight education. We want your children to love learning, and for you to love teaching. We want your children to grow up in a joyful home, surrounded by good literature and good conversation. And all of this with no training, no prep time. Because all the prep work has been done for you. "Just open [the Instructor's Guide] and go" as so many other Sonlighters have already discovered. You know education is expensive. A year of public school costs taxpayers over $10,000 per student. Read that again: $10,000 annually per student. And after spending over $150,000 for all those years of schooling, only about one in three students is ready for college. Not that a parent pays that entire burden per student. But, I'm told, public school parents do pay several hundred dollars a year in addition to taxes to send their children to the public school. (See, for example, A Free Public School Education Still Costs a Ton). Between uniforms, art supplies, fund-raisers, fees, teacher appreciation gifts ($200 per family is not unknown), and so on, a public school education is definitely not free! And the price for a year of private school averages over $9000. It's a bit silly to compare the real-life benefits of a close relationship with your children, and their success in life, to the price of a smartphone. But may I offer a comparison? If you're willing to spend the standard $1200 or so a year on your smartphone,1 might it be reasonable to spend a similar amount on your children's education for a year? If you're willing to spend the standard $1200 or so a year on your smartphone, might it be reasonable to spend a similar amount on your children's education for a year? Your Facebook feed today probably won't be memorable in thirty years, but the books you read with your children—the amazing Sonlight books: I can guarantee you'll remember them! A Sonlight All-Subjects Package won't cost you as much as an average smartphone. It won't cost you $1200. It won't cost you $1000. By the time you've totaled the price of sixty books, plus Instructor's Guides, Science supplies, Math books … : that's a lot of materials. But we don't charge full price. You get a full twenty percent off. So no All-Subjects Package costs even $1000. This is an incredible bargain. Less than $1000 for an award-winning heirloom library of books your family will enjoy for a lifetime and more. Less than $1000 for increased fellowship and lifelong relationships. 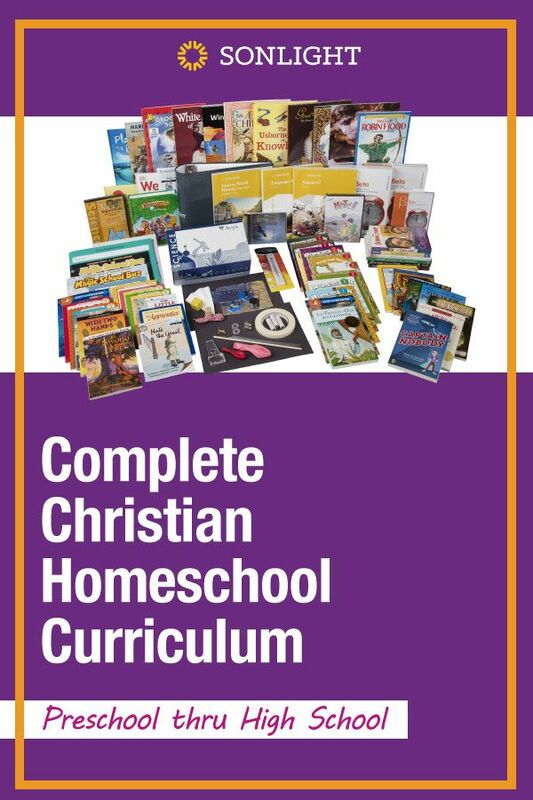 Less than $1000 to equip your children, this year, for whatever God calls them to do for the rest of their lives. Of course, you could put together a basket of ingredients more or less equivalent to what Sonlight offers. You could take on a part-time job of curriculum assembly. Even if you spent only five hours a week during the 36-week school year trying to pull together books from the library and create a reasonable schedule—that's 180 hours. And if you paid yourself the federally mandated minimum wage ($7.25) for all those hours, that would total $1305. Library books have to be returned. Unlike your personal library that you get to keep. And enjoy for as many years as you want. Is your time worth minimum wage? Maybe not. But, then, what value do you place on your time and life? I would rather use the best quality materials (shipped at no additional charge direct to my door), enjoy school with my children, and spend the rest of my time doing things that I love. You can homeschool. With joy. 1 See The Total Price of Smartphone Ownership. Return to text.